They say that finishing the last 10% of any project is the hardest part. Anyone who has remodeled a house or tried to lose those last 10 pounds knows what I am talking about. Well the same holds true for knitting. 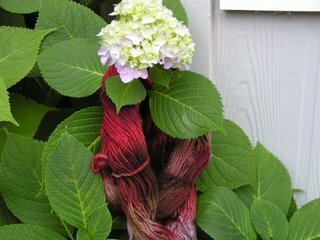 We are actually all yarn harlots at heart - we are so excited to purchase the yarn, find the pattern, cast-on the project. Then we knit away, loving the yarn, loving the pattern, loving the fill-in-the-blank. But then something happens. We become fickle. We put down that project before finishing it and pick up a new love. We'll get back to the other project - truly we will. I once read that if you can count how many projects you have on the needles you don't have enough! I definitely don't have any issues there. But then ultimately we remember our earlier love, pick it back up and "finish" it. But do we really? Yes we finish knitting it, we cast off and say "it's done". But did we bury the ends? Sew on the buttons? Attach the handles? Well I have several projects in the "finished but not done" state so this weekend I devoted myself to finishing them. 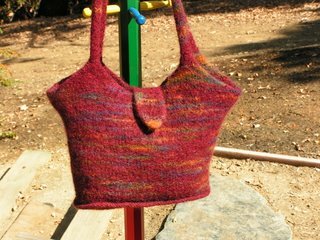 First was my runabout purse for the Bag KAL. 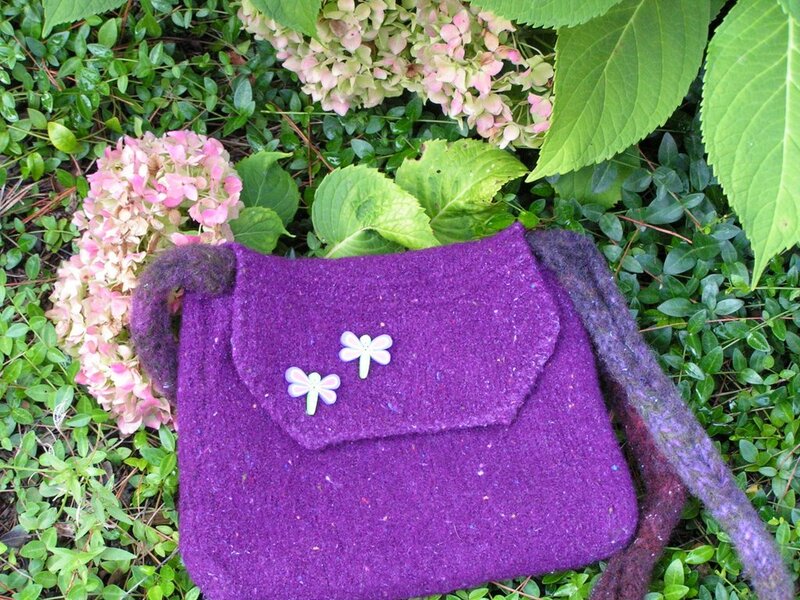 I finished knitting and felting it in July but it still needed something. The yarn was very pretty by itself and flecked with multiple colors before felting but afterwards it was just sort of solid purple and needed "something". So this weekend I sewed on two cute dragonfly buttons (they are more colorful than the photo shows) and put in the snap. Now it is truly done and ready for use. Then I finished knitting the bag I started in Oregon and I felted it. I'm very happy with how it turned out. It still needs the snap but what can I say. I figure that now that those two are basically done it's time to start a new project. So the yarn above is to begin the bag for my International Tote Exchange II partner. It's wonderful, soft Malabrigo which I've never used before. Now if only I can finish it . . . . .
OMG - I love the bags!! Nice job. Will you be sporting one of these fine bags on Saturday?? What pattern is the bottom bag ... is it the Fling Bag? ?